Kannur has a number of tourist attractions including beaches, hills, temples and other monuments. 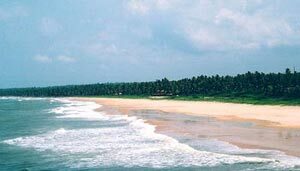 The main attractions of Kannur District are its beautiful beaches. The beaches in Azhikode area are pristine and unvisited. 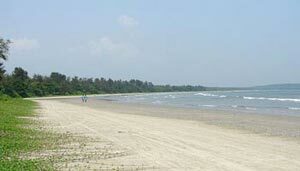 Meenkunnu beach in Azhikode, for example, is highly valued by European visitors. There is a drive-in beach at Muzhappilangad which is the longest in Asia where sand is solid enough to drive for kilometres. The temples and Theyyam dances are another attraction. The riverside temple at Parassinikkadavu is one of the most famous temples. There are beautiful forts at Kannur and Thalassery. There is an old Muslim palace called Arackal palace at Kannur beach. There are silent and secluded beaches in places like Adi-Kadalayi and Thayyil in Kannur city. If you are a temple visitor, there are numerous choices in every part of the district. Places of interest in Kannur range from forts, beaches, museums and much more. The enchanting sandy beaches lined with evergreen coconut palm groves at Payyambalam, Muzhuppilangad, Dharmadam, St. Angelo's Fort, Thalassery Fort, and Bakel fort as well as Snake Park at Parassinikadavu are a few of these. Apart from its idyllic beaches, Kannur is famous for its handloom industry and folk arts and culture. The resonant past and plenty of myths and legends have earned Kannur, the capital of an ancient kingdom, the name 'the crown of Kerala'. Temperature is moderate in December and January and records as low as 20° Celsius. On certain days the night temperature may go down to 16° Celsius. During the months of April and May, the mean daily maximum temperature is about 35° Celsius. Kerala's finest handloom fabrics are woven from the looms in Kannur. It is known as the city of looms and lores. Sizable number of student tourists and research scholars particularly from U.K., Germany, France, USA, etc visit the region for academic and research related work. Many of them are engaged in studies in Ayurveda, Yoga, Kalari and Theyyam. They manage to combine their studies with pleasure by suitably modifying their travel itinerary. The new Kannur International Airport will tap the vast tourism potential, aid the textile industry, and help students/research-scholars apart from 'non-resident' Indians, expatriates, business travellers, IT professionals and corporate magnates, and enhance the region's position as an international tourist destination. Burial sites of the Neolithic age have come to light in certain parts of Kannur district. The Thaliparamba-Kannur-Thalassery area abounds in rock-cut caves, dolmens, burial stone circles and menhirs, all of megalithic burial order. It is assumed that the first batch of Aryan immigrants into the state entered through North Kerala (Malabar). Area of water bodies in ha. In the 14th and 15th centuries, under the Kolathiri Rajas, Thaliparambu became a famous centre of learning, enlightenment and culture. Rajadhiraja temple at Thaliparambu had a major role in this. Assimilation of different styles of Aryan and non-Aryan culture, and the influence of Jain and Buddhist philosophies shaped the culture of the people here. Though the social set-up has been changed by time, the cultural life of the people remains unchanged. Folk Dances: A large number of folk plays and dances are prevalent among the scheduled castes and tribes. Each tribe has its own glorious collection of folk plays and dances which are performed during festivals. The Malayans have the Thiyyattom ceremony which consists of dancing with masks and singing and the Ucchavali ceremony which is symbolic of human sacrifice. The Paniyars have their own characteristic dance. 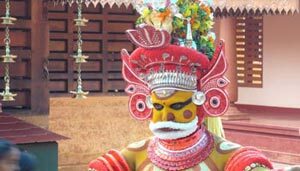 Godamuri is an entertaining folk-play of a quasi-religious nature which is performed in the central parts of Kannur district by the Malayans. Vedan Pattu: This is a peculiar ceremony observed in certain parts of the district in the month of Karkidakam (July-August) which coincides with the season of scarcity in Kerala. Kathakali: The 300 year-old dance form known as Kathakali is exclusive to Kerala. It combines opera, ballet, masque, and pantomime to create one of the most elaborate and technically difficult dance forms. Theyyam: This is a highly ritualistic dance, well preserved with its rare and gorgeous make-up and costume, lively foot work and gymnastic servour. It represents a glorious period of folk-life in Kannur. The belief is, the gods and goddesses come in to our midst through the medium of the possessed dancers and converse with us on matters of even contemporary significance. It is sometimes found that Theyyams (the dancers) pronounce judgments on temporal matters and give blessings to the believers. The performers belong to Mannan, Velan and Malayan communities. They were patronized by the feudal chiefs of Ezhinadu, Puzhinadu and such other places where the Dravidian culture maintained its supremacy. The folk singer, while he sings out in a loud voice, uses simple but effective language and straight but thought-provoking images. Theyyam songs belong to a literary tradition of the farthest past which had not evolved through any conscious process of sophistication, but served as a life-giving vehicle to the feelings of village communities. Marathukali: It is a competitive "game art" conducted in temple yards. It has gained ritualistic importance. The game lasts for a long time; at times it may extend to a day or more. Poorakkali is a temple festival held in the Bhagavathy temples in the month of Meenam (March-April). In this festival which lasts nine days, the local people celebrate the rebirth of Kama, the god of love and rejoice in regaining the feelings of love. It has a dramatic folklore touch and its literature is embellished with glorious deeds of Lord Siva and Lord Vishnu. Vadakken Pattukal: Ballads sung in praise of the exploits of local heroes form an important source of inspiration for the community. 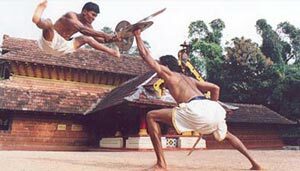 Kalaripayattu: Kalari meaning school and Payattu meaning combat, Kalaripayattu is one of the advanced combat sciences of the world and has reproduced many a hero whose exploits are celebrated in legends and folk songs.